The following document was published on the personal blog of Virgin Group founder Richard Branson, who is a member of the Global Commission on Drug Policy. In the post, Branson said that the unreleased position paper had been circulated by the UN Office on Drugs and Crime and was supposed to be announced at an upcoming conference in Malaysia. After the document was published by Branson, the UNODC released a statement claiming that the document was "neither a final nor formal document . . . and cannot be read as a statement of UNODC policy" endorsing decriminalization. The statement called the incident a "unfortunate misunderstanding about the nature and intent of this briefing paper" and also denied that "there has been pressure on UNODC to withdraw the document." This document clarifies the position of UNODC to inform country responses to promote a health and human rights-based approach to drug policy. It explains that decriminalising drug use and possession for personal consumption is consistent with international drug control conventions and may be required to meet obligations under international human rights law. Decriminalisation of drug use for non-medical purposes and possession for personal consumption can be as a matter of law (“de jure”) and as a matter of practice or policy (“de facto”). De jure decriminalisation is the removal of criminal sanctions with the optional use of civil or administrative sanctions, such as fines or education. De facto decriminalisation (sometimes called depenalisation) is the decision in practice or as policy to not apply criminal or administrative penalties for certain offenses. In de jure decriminalisation models, personal possession and use remain unlawful, but are not criminal. In de facto decriminalisation models, personal possession and use remain criminal but may be addressed with alternative sanctions for offenders who are drug dependent or have committed minor crimes. Treating drug use for non-medical purposes and possession for personal consumption as criminal offences has contributed to public health problems and induced negative consequences for safety, security, and human rights. Health consequences and drug-related deaths: The threat of arrest and criminal sanctions have been widely shown to obstruct access to lifesaving health services like sterile needles and syringes, opioid substitution therapy, naloxone for overdose, fueling HIV and hepatitis C epidemics among people who use drugs, and contributing to preventable deaths from those blood borne viruses and drug overdose. Discrimination, social exclusion and violence: The heavy emphasis on criminalization has fueled high levels of discrimination against people who use drugs, including exclusion from workplace, from education, from child custody and from health care. People who use drugs, especially women who use drugs, are particularly vulnerable to sexual, physical and psychological abuse. Incarceration: Worldwide, millions of people are imprisoned for minor, non-violent drug-related offences, in spite of the international drug control conventions’ provisions permitting to apply alternatives to conviction in cases of a “minor nature”. In many countries, a disproportionate share of those incarcerated is from the most marginalized groups such as people who are poor, and racial or ethnic minorities, leading to prison overcrowding and related negative consequences, including pre-trial detention. Incarceration, in turn, fuels poverty and social exclusion, as having a criminal record can negatively affect access to future employment, education, housing, and child custody and also exercising civil rights such as voting. Poor conditions and lack of HIV services, including drug dependence treatment, in prisons can fuel HIV, viral hepatitis, and tuberculosis infections among people who use drugs, and increase overdose risk. Governments have a duty under international law to take steps to reduce supply of and demand for controlled drugs. In doing so, they must ensure that these efforts are balanced with obligations to ensure adequate availability of controlled drugs for medical and scientific purposes and that these steps are consistent with states’ human rights obligations. States have obligations under the right to health to take all necessary steps for the “prevention, treatment and control of epidemic… diseases,” to ensure access to essential medicines, and to take affirmative steps to promote health and to refrain from conduct that limits people’s abilities to safeguard their health. According to the UN Committee on Social and Economic Rights, laws and policies that “are likely to result in… unnecessary morbidity and preventable mortality” constitute specific breaches of the obligation to respect the right to health. The international drug control conventions grant some flexibility with respect to possession for personal consumption of controlled substances for non-medical or non-scientific use. The 1988 international drug control convention states that States parties shall establish possession for personal consumption as a criminal offence, but specifically provides a carve-out to allow States a margin of discretion. As noted by the International Narcotics Control Board “the international drug control treaties do grant some latitude with regard to the penalization of personal consumption-related offenses…” Parties to the 1988 international drug control convention are required to establish as criminal offenses activities preparatory to personal consumption, subject to each party’s constitutional principles and the basic concepts of its legal system. This means that states can opt out of the requirement to criminalise possession for personal consumption if it would be unconstitutional (based on, e.g., the right to privacy or liberty) or otherwise contrary to their legal systems. Small drug related offenses, such as drug dealing to maintain personal drug use or to survive in a very marginalized environment, could be interpreted as drug related offenses of a ‘minor nature’, as mentioned in the international drug control conventions. These cases should receive rehabilitation opportunities, social support and care, and not punishment. Restrictions on certain rights may be imposed if they are prescribed by law, non-discriminatory and proportionate – that is, no more than is necessary to achieve a legitimate aim. The state has the burden to justify that criminalisation meets this test.xiv Protecting public health is a legitimate aim, but imposing criminal sanctions for drug use and possession for personal consumption is neither necessary nor proportionate. On the contrary, punishment aggravates the behavioral, health and social conditions of the affected people. States can use non-penal, public health measures to address drug dependence and drug use, including providing access to evidence based drug dependence treatment and other harm reductionxv services, and social support. Arrest and incarceration are disproportionate measures and as noted above, can affect access to fundamental rights to health, work, education, housing, vote and separate parents from children. Ensuring that their existing legislation, policies and enforcement practices are up-to-date with respect to scientific evidence on drug use, drug dependence, HIV and conform to international human rights obligations. Meaningfully involving members of the affected communities in developing, implementing, monitoring and evaluating services and policies that affect their health and lives. 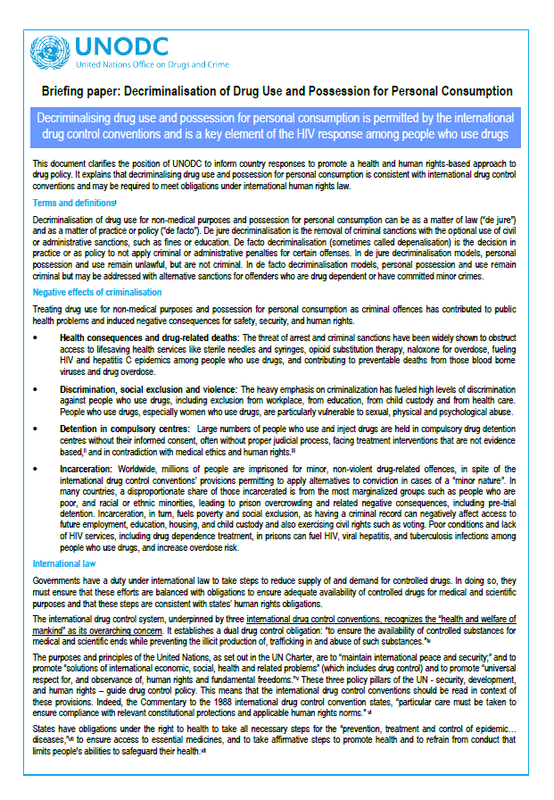 Implementing and scaling up the comprehensive harm reduction package of interventions for HIV among people who inject drugs, as spelled out in the WHO, UNODC, UNAIDS Technical Guide. Investing more resources in science, evidence and human rights-based interventions, including drug use prevention, treatment of drug dependence and other harm reduction interventions.